The doctrine regarding the Trinity (the three Persons of the Godhead) isn’t something that any finite individual can fully comprehend. The concept is beyond the grasp of our mortal minds. And yet, God has given to mankind a great deal of information about the Trinity throughout the Scriptures—information that His created beings may and must understand, albeit imperfectly. Although the term “Trinity” isn’t found in any Bible verse, that which the Trinity comprises is found from Genesis through Revelation. In Genesis:1:26, God declared, “Let us make man in our image, after our likeness” (emphasis added, here and throughout). Isaiah:48:16: “Come ye near unto me, hear ye this; I have not spoken in secret from the beginning; from the time that it was, there am I : and now the Lord GOD , and his Spirit , hath sent me .” The Gospel of Matthew ends with this commission: “Go ye therefore, and teach all nations, baptizing them in the name of the Father , and of the Son , and of the Holy Ghost ” (28:19). ), continually refers to the person of God the Father as His Father. The religious leaders of the Jews sought to kill Him because He said “that God was his Father, making himself equal with God ” (John:5:18). In John:14:26, Jesus tells of the “Comforter, which is the Holy Ghost, whom the Father will send in My name, He shall teach you all things….” Again, three divine Persons: Father, Son, and Holy Spirit. In Genesis:1:1 we find “In the beginning God created the heaven and the earth.” The Hebrew word for “God” there (and in more than 2,000 other OT places) is elohim , which means “gods.” Moreover, the plural noun elohim is nearly always used with a singular verb, which plays havoc with the grammar. Likewise, throughout the Old Testament, God is presented as a plurality by using the plural pronouns “us” and “our,” e.g., “Let us make man in our image.” “The man is become as one of us.” (Genesis:1:26; 3:22). Since Scripture declares God to be “One,” such usage either loads the Bible up with multiple contradictions, or what is presented simply underscores the fact that the Bible teaches that God is one, yet made up of three Persons. The Godhead has not only perfect harmony and unity but diversity. That’s why there must be more than one divine Person included within God. Although we cannot naturally fathom a triune God due to the transcendent nature of such a concept, we can see that reason and logic support the very idea. God must be perfectly unified in mind and in purpose in all things—which the Father, Son, and Holy Spirit indeed are. When Jesus said, “The Son can do nothing of himself, but what he seeth the Father do: for what things soever he doeth, these also doeth the Son likewise” (John:5:19), He was not saying that He had no power to do anything but that He was conforming to the will of His Father in everything. He confirmed this in the Garden of Gethsemane: “Being in an agony he prayed more earnestly: and his sweat was as it were great drops of blood falling down to the ground” (Luke:22:44) as He faced what He would have to experience in order to pay for the sins of mankind. He prayed to the Father: “O my Father, if it be possible, let this cup pass from me: nevertheless not as I will, but as thou wilt ” (Matthew:26:39). Jesus completely submitted Himself to His Father. The “God” that is worshiped by Jews, Muslims, Jehovah’s Witnesses, and Oneness Pentecostals is a single entity and is therefore incomplete. How so? The Scriptures teach that God is love, and love must have an object. Therefore, a singular Eternal Being would have no one to love prior to His creation of human beings, whom He could love. That would make such a god imperfect and in need of created beings, which isn’t the case with our triune God. Throughout eternity, “The Father loveth the Son, and hath given all things into his hand” (John:3:35). “And I have declared unto them thy name, and will declare it: that the love wherewith thou [Father] hast loved me may be in them, and I in them” (John:17:26). At the Mount of Transfiguration, God the Father declared regarding Jesus: “This is my beloved Son, in whom I am well pleased; hear ye him” (Matthew:17:5). One of the major features of the Bible is God’s revelation of Himself. Without such information coming directly from God, man is left with only his own speculations about his Creator, which is always a dangerous position. The great commandment is to love God with all one’s heart , soul, mind , and strength . It is impossible to love God this way unless we know Him in truth—and that can occur only if we understand, with the help of the Holy Spirit, what He has declared about Himself in His Word (1 Corinthians:2:14). Consider the following, not only in regard to the unreasonable concept of God as a solitary Being, who would be therefore incomplete, having never had another eternal person to love and with whom to have fellowship prior to the Creation, but more so in what takes place within the perfectly unified relationship among the Father, Son, and the Holy Spirit. Those who preach the superiority of the Father based upon Jesus’ statement: “My Father, which gave them me, is greater than all” (John:10:29) miss the context, which underscores God’s power to keep those who believe in Him. ; 2:13). These verses can be reconciled only in our triune God. Both the Father and Jesus are God. They send the Holy Spirit (John:14:16; 15:26; 16:7). All three glorify one another (John:17:1). Jesus submits to the Father, and the Holy Spirit submits to both the Father and the Son (Matthew:26:39; Luke:11:13; John:15:26). Although each divine Person has a different role within the Godhead, they nevertheless all function in perfect accord with one another. When Jesus, whom the Father sent, became a Man, the God-Man, and went to the cross to pay the full penalty for the sins of mankind, the Father accepted Christ’s sacrifice in order to reconcile humanity to Himself: “Blessed be the God and Father of our Lord Jesus Christ, which according to his abundant mercy hath begotten us again unto a lively hope by the resurrection of Jesus Christ from the dead” (1 Peter:1:3). This was the plan of God, authorized by the Father, executed by Jesus, and empowered by the Holy Spirit. The role of the Holy Spirit is to “testify of [Jesus]” (John:15:26). Furthermore, He convicts the world of sin, enables sinners to be born again, seals them, helps them to understand the Scriptures, and guides and empowers them for godly living and witnessing (John:16:8; 3:5; 2 Corinthians:1:22; John:14:26; 16:13; Acts:1:8). Although in submission to the Father and the Son, He is nonetheless fully God, “the Spirit of truth, which proceedeth [goes forth] from the Father” (John:15:26). ). Such things can be the function only of a personal Being and can be denied only by imposing one’s unbiblical and prejudiced view of the Holy Spirit. Although the doctrine of the Trinity gives believers wonderful insights into the character of God, it also provides clarity regarding how we’re to relate to one another in a manner that’s pleasing to Him and that produces fruitful results in our lives. For example, we can use the picture of the relationship of the Father, Son, and Holy Spirit to learn about the way that God intended for a marriage between a man and woman to function. 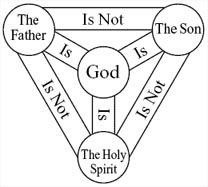 As noted, the Father, Son, and Holy Spirit are co-equally God. In the same manner, the husband and wife are co-equal—though their roles differ, neither is considered superior in God’s eyes. He is biased toward neither. Submission is another area in which the union of man and woman in marriage is a picture of the Trinity. The husband is the spiritual head, with his wife in submission to him, just as Jesus is in submission to His Father, and the Holy Spirit submits to the Father and the Son. Question: An atheist friend has tried to persuade me that ethics and morality can be derived...by determining what behavior would be beneficial for most people and thus for the survival of mankind. I find it difficult to dispute his point. Can you help? When and Where Was the Sermon on the Mount?